Tricia's Take: OOTD- Orange sodie-pop! What a cute top! I love it paired with your cardi, but what I really love are your sandals! You look adorable! What a cute top. I love the mix of colors here. i have that top and it has been sitting in my closet for forever. This is so fun, I love it! Great combo! I can see why you wore this outfit again - it is so fun and colorful! So pretty Tricia. I love that F21 tank, especially w/the turquoise cardigan! You look awesome in this! I love these colors together and that top is SO fun!!! So cute! Love your mix of colors as always! I'll go ahead and sound like everyone else who has commented...love these colors together! You play with colors so well. By the way, is the sun bleaching your hair or are you going more of a strawberry blonde? I can see so much more family resemblance between you & Jessica now that you don't have your bangs. 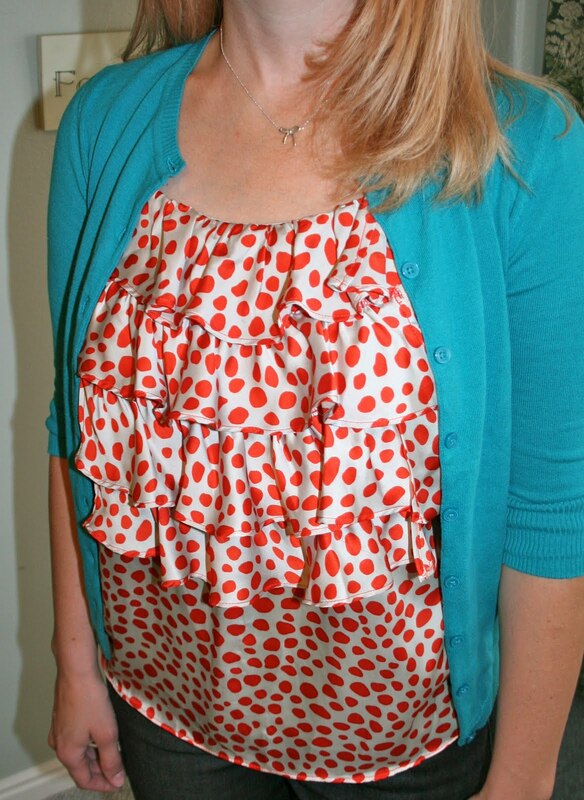 Oh my goodness -- that polka dot top is too cute, Tricia! And the turquoise and red combo is so fresh and vibrant -- love it! Hope you're having a great weekend! Love the bold color choices here Tricia, very chic!